The Reverend Cyrus Field Frazier, Jr. of Mt. Holly, NC passed away peacefully at home Saturday November 24, 2018. He was born August 23, 1927 to the late Cyrus Field Frazier and Zelda Belle Huffman Frazier of Claremont, Catawba County, NC. He is preceded in death by his first wife and mother of his three children Ann Cline Frazier, and by his second wife Anne Hartsfield Smith Frazier. He is survived by his children: daughter Laura Frazier Merritt and husband William Benjamin Merritt (Bill), son Cyrus Field Frazier III (Rusty) and wife Elizabeth Newman Frazier, and son Matthew Woody Frazier and wife Tamara Powell Frazier; one brother, Jackie Lafayette Frazier and wife Nancy Margules Frazier; niece Leslie Frazier Schwartz and husband Bennett Schwartz, nephew David Frazier and wife Elena Garcia Frazier; grandchildren Emily Merritt Reeves and husband Brandon Reeves, William Benjamin Merritt, Rachel Merritt, Zachary Merritt, and Cyrus Frederick Frazier; and great-grandchildren Colton Nash Reeves and Rhett Maddux Reeves. Rev. Frazier was affectionately known to close family and friends as “Buddy”, a nickname he picked up while living in Lenoir, NC from the railroad workers he became acquainted with during the time his father worked as a telegraph operator for Southern Railroad. He later moved with his family to Granite Falls, NC. There he would meet, fall in love with, and marry Ann Ranes Cline who remained his beloved wife until she passed away in 1984. He attended Lenoir-Rhyne College and graduated in 1953, and went on to earn a Masters of Divinity degree from Southern Theological Seminary in 1956. He accepted a call from Good Shepherd Lutheran Church in Mt. Holly, NC in 1956 and remained at Good Shepherd as its sole pastor until he retired in 1992, a period of 36 years. While serving Good Shepherd his ministry reached untold numbers through sermons, baptisms, marriages, funerals, and counseling. He incorporated the use of the Chrismon tree during Advent and Christmas as well as the Hanging of the Green, and Lenten services wherein he re-enacted the lives of biblical characters such as Barabbas, King Herod, and Judas Iscariot. 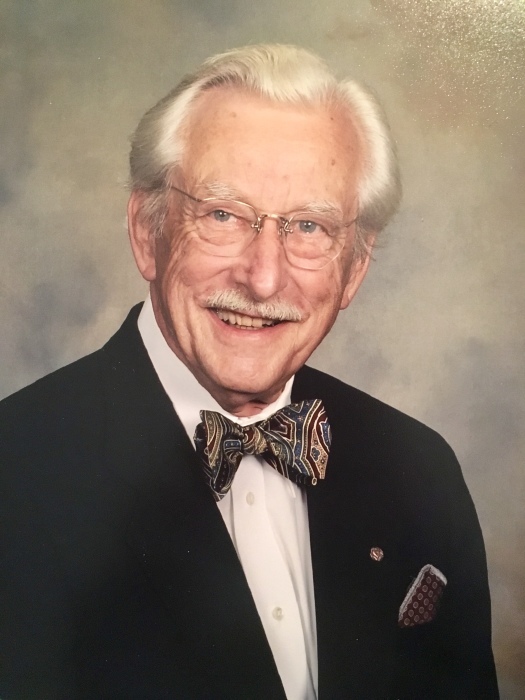 After retiring in 1992 he went on to serve as interim minister with many other Lutheran parishes in and around Gaston and Mecklenburg County, and stayed busy by volunteering as a host conductor for Amtrak on the Carolinian. Pastor Frazier had many loves and interests, first among which was the ministry and serving the parishioners of Good Shepherd and the community. He loved to shop and was known for his dapper appearance and bow-ties. He smoked a pipe for most of his adult life, loved anything to do with steam locomotives and models of them, Coca-Cola memorabilia, creating Chrismon ornaments, shopping for antiques, browsing, traveling to the NC mountains, making home-made soap, baking bread, making wine, keeping bees, growing and canning vegetables, and building big fires in winter. He was a member of the Mt. Holly Rotary Club, was 1985 Mount Holly Man of the Year, and was a member of the Mt. Holly Beautification Committee and was responsible for planting numerous crepe myrtles in the downtown area that thrive to this day. Reverend Frazier will be remembered by many for his easy-going manner, warm, welcoming personality, and home-spun humor and sayings. Special thanks is given to his personal caretakers Debbie Smith and Jackie Stinson who saw to his daily needs and were his companions over the past few years as his health declined, and to the folks at Stress Free and Gaston Hospice. The attention and care he received from these folks enabled him to live out his remaining years in comfort and peace at home. A service to celebrate the life of Rev. Frazier will be held 2:00pm Saturday December 1, 2018 at The Lutheran Church of the Good Shepherd in Mount Holly with Pastor Jonathan Schnibben officiating. Interment will follow at Hillcrest Gardens Cemetery. The family will receive friends from 12:00-2:00pm prior to the service at the church. In lieu of flowers, memorials may be made to Gaston Hospice or the Lutheran Church of the Good Shepherd.